Back in December I made up my mind to run my first marathon, the L.A. Marathon on Feb. 14, 2016. After many weeks of training and lots and lots of miles, we finally headed out to Los Angeles last weekend and made a little family trip out of it. Being my first marathon, my amazing sister and nephew also came to cheer me on. We arrived Saturday at noon and went straight to pick up my bib and check out the expo for a bit before getting some food. We were super excited to go eat at Seoul Sausage, since they were previous winners of The Great Food Truck Race on The Food Network. It originally aired a few years ago, but we just recently saw it on Netflix ;) Before we left Vegas, I jokingly asked the kids if they thought we'd see the guys from the show and of course, they both said we wouldn't see them. Well, to their surprise (and mine) 2 of the 3 owners showed up right as we finished our late lunch. They were super nice guys and took a picture with the kids. This really made their day. 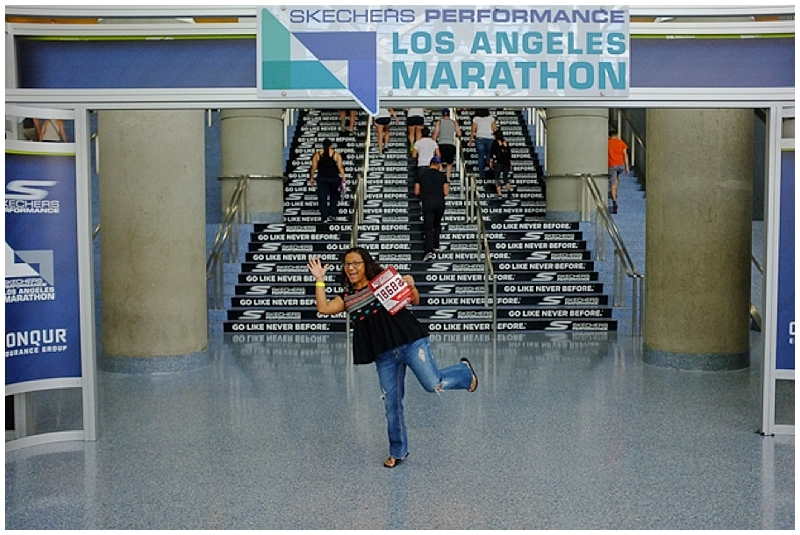 The following day I ran the L.A. Marathon. Jason saw me off at the start line and then my family was waiting and cheering me on at mile 11. That really gave me the boost I needed to keep going for a few more miles. The first 18 miles or so were a ton of fun and I was feeling great, but the last 8 miles were brutal for me. Crossing that finish line was such a huge relief. If you want to read more details and see more photos from my race, feel free to go on over to my blog, It's a Messy Life. After the marathon, we walked to the Santa Monica Pier and grabbed some food at Bubba Gump Shrimp Co. After my burger and beer, we walked down the pier so the kids could ride the roller coaster before heading back to our condo in Hollywood. We were all too tired to go out to eat dinner like we had originally planned, so we ordered some chinese food, popped open our celebratory bottle of Perrier Jouet and called it a day! The next day started out a little rocky with cranky kiddos, but thankfully we were able to turn it around and enjoy our morning walking around the grounds of the La Brea Tar Pits and L.A. County Museum of Art. That was exactly what we needed to unwind and relax a bit before driving back home. It was a jam-packed 3 day trip full of fun memories for sure! Getting away and spending time with family is always the best.